First Vice President Nolan Astley. 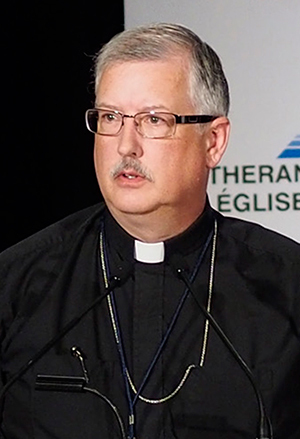 CANADA – On June 25, Lutheran Church–Canada’s (LCC) Board of Directors voted to appoint Rev. Nolan Astley as the Interim Pastoral Leader for Alberta and British Columbia. Rev. Astley also serves as First Vice President for LCC. LCC President Robert Bugbee had announced his recommendation for Interim Pastoral Leader earlier in June. The Alberta-British Columbia District Convention in May adopted a resolution separating the pastoral and corporate functions of the District President, acting on a recommendation from LCC’s Board of Directors. The Interim Pastoral Leader (who was to be appointed by LCC’s President and BOD, in consultation with District leadership) would provide ecclesiastical oversight in Alberta and British Columbia, while the District President would focus on the corporate responsibilities of the District. Vice President Astley will begin official service as Interim Pastoral Leader on September 1, in keeping with the ABC District’s new triennium and change of officers. He noted that he is looking forward to working with District Staff, especially President Elect Glenn Schaeffer. At its recent meeting, LCC’s Board of Directors determined that the salary of the Interim Pastoral Leader position would be paid by Synod. They expressed appreciation for the offer of the ABC District Convention to pay the salary for the position, but noted that, given the legal complexities of the current situation in the ABC District, it would be best if LCC covered the cost. Those wishing to contact Vice President Astley regarding Synod and District matters may contact him at nolan.astley@lutheranchurch.ca.